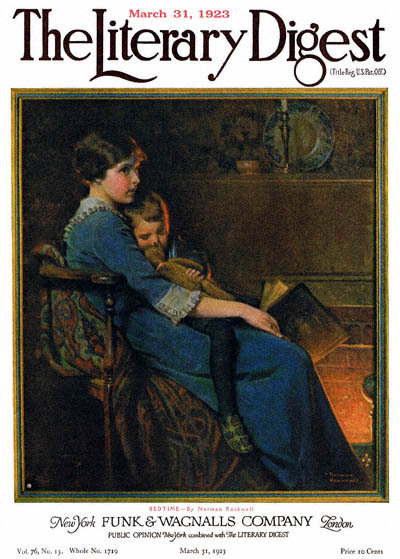 Bedtime, this Norman Rockwell painting, appeared on the cover of The Literary Digest published March 31, 1923. The alternate title for this illustration is Mother Reading to Child by Fire. This illustration was Rockwell's forty-fourth picture featured on the cover of The Literary Digest. Beginning with his first cover in 1918, Boy Showing Off Badges to the last, The Night Before Christmas in 1923, Norman Rockwell artwork was published on The Literary Digest cover forty-seven times in all. Rockwell artwork was featured on the cover of The Digest five times just in 1923. This illustration was reproduced on page 62 of Norman Rockwell, A Definitive Catalogue by Laurie Norton Moffatt. The location of the original painting is currently unknown. Rockwell was a master of painting scenes recalling days gone by. Bedtime was only one of 47 Norman Rockwell Literary Digest covers; here is the list of more Norman Rockwell Literary Digest scans. With this painting, Norman Rockwell takes us back to one of the joys of childhood - Mother's lap. This mother and child painting evokes peaceful, contented feelings. The mother and child in this painting are preparing for bedtime. Mother is reading a bedtime story to her sleepy sweet child by the roaring fire. The child has no chance of staying awake. The child is holding his teddy bear. He has changed into his pajamas and bedroom slippers. He is now slowly drifting off to sleep. Mother has started putting the book down. She has a contented look on her face. She is starting to relax a bit herself. The warm glow of the fire is starting to work its charm on mother as well. In the background on the mantle, we see a candlestick and candle. It is almost time to put mother's sweet child to bed.